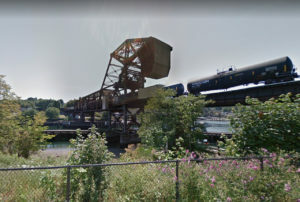 Construction of a replacement for a century-old bridge on the Everett-Seattle mainline is expected to cost BNSF about $200 million. The bascule bridge crossing the Lake Washington Ship Canal on Salmon Bay near Ballard was built in 1914. “As it goes up and down with a counterweight, what we found was that the trunnion bearing [on which the bridge rotates] was getting fatigued,” said BNSF spokesperson Courtney Wallace. BNSF replaced the trunnion bearings about a decade ago. About 30-40 passenger and freight trains cross the bridge each day, clearing marine traffic through the Ballard Locks. For tall ships, the railroad is proposing a vertical lift bridge with 155 feet of clearance. The company expects the project’s permitting phase to take two years before a new span is constructed parallel to the current bridge, expected to last three years. BNSF will then remove the old bridge.